Discernment is the process of making careful distinctions in our thinking about truth. The discerning person is the one who draws a clear contrast between truth and error. Discernment is black-and-white thinking—the conscious refusal to color every issue in shades of gray. No one can be truly discerning without developing skill in separating divine truth from error. Do not be fooled by professing Christians who prefer either “progressive Christian” or “social justice Christian” to evangelical. It matters not what trendy terms people use to describe themselves, a progressive by any other name is still a liberal. So it should not come as a surprise to learn that some PC’s are avowed Marxists. Marxism is the theory of economics and politics of atheists Karl Marx and Friedrich Engels that holds that “actions and human institutions are economically determined, that the class struggle is the basic agency of historical change, and that capitalism will ultimately be superseded by communism.” Clearly, this theory is unbiblical. By calling ourselves progressive, we mean we are Christians who recognize the faithfulness of other people who have other names for the way to God’s realm, and acknowledge that their ways are true for them, as our ways are true for us. That, brethren, is moral relativism. Again, unbiblical. So here’s the bottom line: Progressive is simply a euphemism for socialism. PC’s do not hold to a high view of Scripture. They out right reject the notion that all Scripture is God breathed — inspired, inerrant, infallible. PC’s will tell you that in their view a large part of the scriptures do not present a true understanding of God’s mind and heart, and much of the Bible is not inspired by the Spirit of God. PC’s hold to a non-traditional view of the Bible. Because they question tradition, they’re willing to re-write Scripture to ensure that God’s written Word is cutting-edge and meets their politically correct criteria. 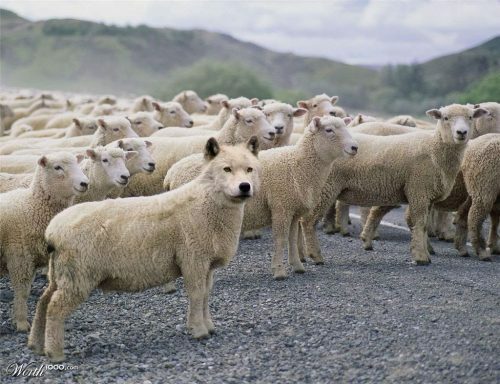 Besides an emphasis on caring for the poor through social justice, PC’s are environmentally conscious and believe followers of Jesus are commanded to be the guardians of the Earth. The religious left demands the redistribution (transfer) of wealth under the guise of social justice. Beware when you hear terms such as “social reform” and “social justice” because those terms are doublespeak for socialism. “The term Emergence Christianity, which adherents such as Phyllis Tickle see as the new reformation, itself incorporates more than just a nod to emergence theory of evolutionary science; and many in the EC believe that, right now, mankind is evolving upward into a higher state of consciousness. Progressive Christians have a deep belief in the centrality of the instruction to “love one another” (John 15:17) within the teachings of Jesus Christ. This leads to a focus on promoting values such as compassion, justice, mercy, tolerance, often through political activism. Though prominent, the movement is by no means the only significant movement of progressive thought among Christians. Progressive Christians represent a more contemporary, diverse expression of Mainline Protestantism, and include a broad spectrum of interpretations of scripture, salvation, the person of Jesus, and the role of Christianity in the world. 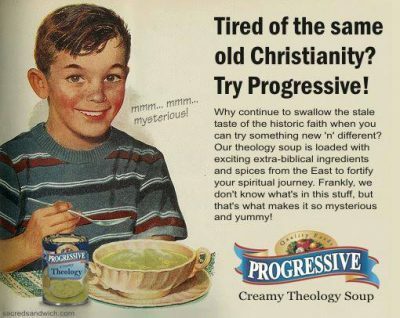 Progressive Christianity can trace its roots to the early 20th century, a period of theological tension and social change in the U.S.
Modernists attempted to reconcile historical Christianity with new scientific findings and philosophy. They were also influenced by “higher criticism”—a way of looking at scripture that challenged its claim to be the word of God—that began in Germany and spread to the U.S.
What emerged was an approach to Christianity that placed less emphasis on theological doctrine and dogma and more focus on the humanistic attributes of Christianity. These Modernist ideas were accepted by many Protestant denominations, but not all. Fundamentalism was a reaction to the growing acceptance of Modernist ideas. Through the remainder of the 20th century and early 21st century, what would become known as Progressive Christianity would be further shaped by social upheaval, religious criticism, and the struggle for racial, gender, and sexual orientation equality. Today, Progressive Christianity is a dynamic movement within the Christian faith that is marked by a willingness to question tradition, a tolerance of diversity, and an emphasis on social justice and environmental advocacy. Recently, Progressive Christianity has served as a spiritual home for believers who have become jaded by more evangelical or fundamentalist strains of Christianity, or those who are looking for a belief system within Christianity that allows for more fluid, individual views. If you feel inspired, learn more about progressive Christianity here! Note: While some of the above are misguided, others (like Jim Wallis) are out right Marxists. What Is The True Gospel Of Jesus Christ? The heart of the Gospel is that our holy, loving Creator, confronted with human hostility and rebellion, has chosen in his own freedom and faithfulness to become our holy, loving Redeemer and Restorer. The Father has sent the Son to be the Savior of the world (1 John 4:14): it is through his one and only Son that God’s one and only plan of salvation is implemented. So Peter announced: “Salvation is found in no one else, for there is no other name under heaven given to men by which we must be saved” (Acts 4:12). And Christ himself taught: “I am the way, the truth and the life. No one comes to the Father except through me” (John 14:6). Discover what the true Gospel is by going here. John MacArthur, Voddie Baucham, Phil Johnson, James White, Tom Buck, Anthony Mathenia, Michael O’Fallon, Tom Ascol, Darrell Harrison, Craig Mitchell, Justin Peters, Jeremy Vuolo and Josh Buice. Social Justice Is An Attack On the Sufficiency of Scripture by Josh Buice New! Slouching to Ancient Rome (Follow up to Revoice: Sliding Into Heresy) by Peter Jones – New! Revoice: Sliding Into Heresy by Peter Jones – New! 5 Facts About Tim Keller/Follow up to ‘Tim Keller’s Full Endorsement of Being Gay & Christian’ – New! Tim Keller’s Full Endorsement of Being Gay & Christian – New! Albert Mohler Forbids SBTS Faculty From Signing “Social Justice Statement” – New! The Life & Teaching of Social Justice Jesus (satire) – New! Living the Questions: The Wisdom of Progressive Christianity Bringing together the voices of top [progressive] Bible scholars and church leaders—including Diana Butler Bass, John Dominic Crossan, Amy-Jill Levine, Brian McLaren, Helen Prejean, and John Shelby Spong—pastors David Felten and Jeff Procter-Murphy present a lively and stimulating tour of what it means to be a “progressive” Christian.